Stock photo of a display of figurines at the Christmas markets in the historic village of Michelstadt, Hessen, Germany, Europe. A store market displays three tall wooden Christmas figures in the historic village of Michelstadt. 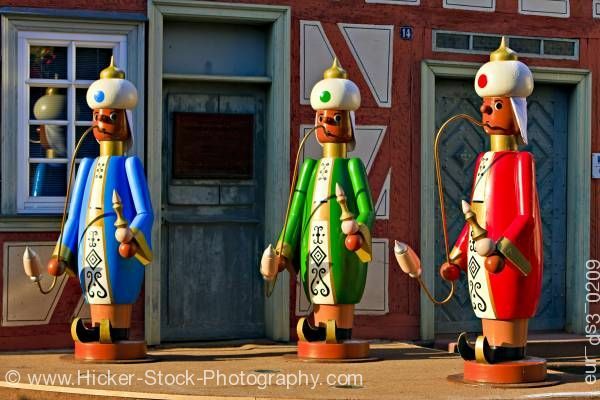 This stock photo shows a display of three figurines at the Christmas markets in the historic village of Michelstadt, Hessen, Germany, Europe. In front of a store market is a display of three tall wooden Christmas figures. Each has a white turban with a gold crown on top, a long “s” shaped pipe from its mouth and holding part of the pipe’s handle in its right hand. Black shoes that have curved pointed toes. Each figurine is wearing a long jacket, one in blue, one in green and the last in red. Each one stands on a round wooden pedestal. The store front is red with panels of the exterior wall painted in white. The front doors are blue and weather worn. A reflection from the window is trimmed in white and shows the back of the blue Christmas figurine. Display at the Christmas markets in the historic village of Michelstadt, Hessen, Germany, Europe.